WHAT IS THE “T” ALL ABOUT? The Raidho X and X-T series of loudspeakers are all built around the same Raidho X-driver that has a very compact and magnetically rigid neodymium magnet motor system. The X and X-T drivers both share an extremely rigid ceramic cone manufactured in a Pio plasma process over 80 hours where a ceramic composition layer is formed in liquid thru a high current/voltage process. The resulting membrane is a sandwich where two extremely stiff ceramic skin layers encapsulates a much softer aluminum core. This sandwich construction has two great benefits for audio reproduction, 1. the cone is very stiff, and 2. It has very very good damping properties. The X driver is truly state of the art in this respect, where the cone works pistonic up to more than 10 KHz and where the first order resonance is a peak of less than 6dB. This makes for a drivers with a membrane that is extremely “quiet” in its working range from the deepest bass and until it is rolled off at app 3Khz. The X-T driver is a further refinement of this already incredible X- driver to make excellent into incredible. The T is Titanium, what we do is that we in a vacuum aided process ad layers of titanium nitride and pure titianium on top of the ceramic X driver membrane. This transforms the X ceramic sandwich cone into an even stiffer and better damped 7 layer sandwiched cone. Now with a first fundamental resonance of 15 KHz and a breakup resonance of only 3 dB… Is it significant..? Oh yes it is, while we can’t really tell the difference in measurements on the final speaker, then we can by listening. Clarity and blackness of the background is greatly enhanced to a degree that will leave you amazed over the richness of instruments and natural details emerging form your music collection. Realism grows and it will really let you explore the intent and fines of your favorite artists. 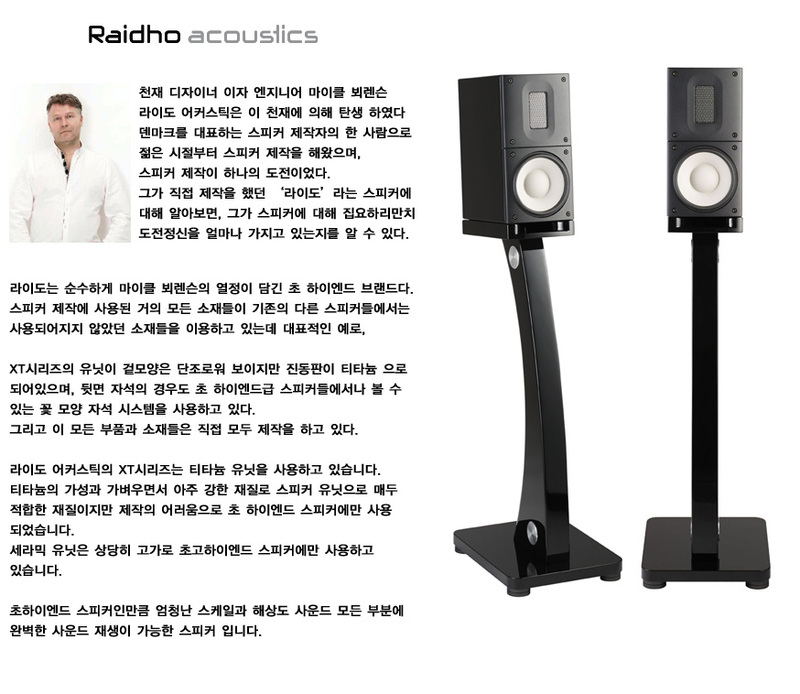 We put the T in the X. Raidho Acoustics’ speakers, the X-1 and X-1T, are elegant and compact size stand-mount mini monitors. The speaker is built with the Raidho Ribbon Tweeter and a bass/mid-range driver with ceramic membrane and ceramic/titanium membranes. The mid-range drivers feature our newly developed neodymium based magnet system in a long throw and low compression design. The loudspeakers are primarily designed for smaller rooms and can be placed relatively close to the rear wall. The X-1 and XT-1 are also very ideal for studio work and near-field monitoring.